Principal photography wrapped this week on a new short film directed by and starring Brendan Gleeson. 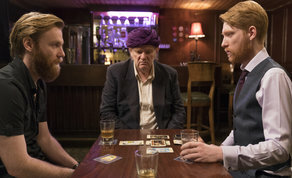 Psychic which was written by Rory Gleeson (Rockadoon Shore), tells the story of a charismatic psychic (Brendan Gleeson) who is forced out of retirement by his two manipulative sons (Domhnall and Brian Gleeson) and taken on the road. The last obstacle to gaining a large cult following is a TV show host determined to bring them down. 'Psychic' is a dark and human tale of showmanship, the other world and family. The film, which stars Brendan, Domhnall and Brian Gleeson alongside Ingrid Craigie (The Delinquent Season, When Harvey Met Bob), was shot in Wicklow and in the National Film School at IADT with the support of the IADT staff and the faculty of film, art and creative technologies. The production is co-funded by the Irish Film Board and Sky Arts and will air on Sky Arts in early 2019. Psychic is produced by Juliette Bonass (A Date for Mad Mary, Glassland, The Last Hotel for Sky Arts) and Brendan Gleeson and is co-funded by The Irish Film Board and Sky Arts. David Grennan (What Richard Did, Maze) is director of photography with Tamara Conboy (Once, Sensation) as production designer, Consolata Boyle (Victoria and Abdul, The Queen) as Costume Designer and Isobel Stephenson (Garage, Adam and Paul) as Editor. Phil Edgar Jones, Director of Sky Arts, said: "At Sky Arts we are always looking for the best creative talent to work with us creating projects they are passionate about so to be part of Brendan's directorial debut is a genuine thrill. We look forward to the adventure continuing." Earlier this year, Sky Ireland confirmed it will invest over €2.2m (£2m) to further boost the Irish production sector as it searches for a new hit entertainment show for Sky One. As Europe’s leading entertainment company, Sky is committed to investing in Irish production to follow the success of home-grown shows like the International Emmy Award winning Moone Boy and the three-series hit, 50 Ways to Kill Your Mammy.